Today the climate camp near Erkelenz is taking down its tents. In the last six days, it was the main base for a series of diverse protests against lignite mining in the Rhineland Coalfields. Thousands of people joined the „Ende Gelände“ mass action of civil disobedience and blocked coal trains. A human chain of 3000 people drew a „Red Line“ against lignite mining the edge of the Hambach forest. Countless smaller groups occupied train tracks and road accesses to power-plant Neurath, or sat singing on a bucket-wheel excavator in the open-cast mine Inden. Three climate camps hosted workshops, public debates, action support groups, emphasizing its outreach to the neighbouring villages and dialogue with worker’s unions. Altogether, 6000 people took part in the protests, demanding climate justice and an immediate coal phase-out. The Rhineland coalfields near Cologne, West Germany, have become a hot spot of the climate movement in the last years. The mining operations include three open-cast lignite mines and four power plants that belong to Europe’s most polluting. Together they emit 80 million tons of CO2 per year. The utility giant RWE and the German government plan to continue lignite mining until 2045. Lignite (brown coal) is one of the most polluting fossil fuels. On Friday and Saturday, thousands of „Ende Gelände“ activists blocked the train tracks which supply Germany’ s dirtiest coal-fired power plant Neurath with coal. On Friday the tracks were occupied for nine hours. On Saturday the blockades were held for six hours. RWE had to reduce the capacities of the power plant for 20 hours. 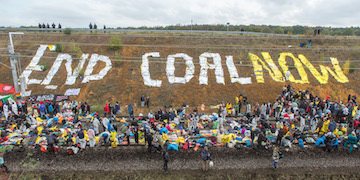 One group of activists also managed to enter the open-cast coal mine Garzweiler. The different „fingers“ of the mass action highlighted various aspects of the climate justice issue, such as workers’ struggles, mobility, agriculture and feminism. The activists acted in a determined but peaceful way. About 800 people were temporarily detained by the police. The police forces used pepper spray and batons to clear the blockades, some activists were dragged away by their heads. Activists reported they were kicked or hit in the face; many suffered from twisted joints; about five people were treated in hospital because of fractures. Ende Gelände spokes people strongly criticize the brutal police operations. Nonetheless, Ende Gelände calls for more mass actions of civil disobedience on November 4-5. While the U.N. climate negotiations will take place in Bonn, the activists are going to block infrastructure in the Rhineland coalfield only 50 km away. In our flickr-files you will find a selection of pictures. In the files „freie Nutzung“ you will find pictures that are free for both commercial and non-commercial purposes (about 10 per action day).Charities etc. are free to use all the pictures if they give credits to the photographers.